A VERY MERRY CAFE-MAS TO YOU ALL! Well, another year almost in the bag, I am guess that’s the same as Santa would be saying tonight as well. We just wanted to wish you all a very Merry Christmas and hope that the New year brings you all great health and wealth and make life fun. I have already penciled in a a few resolutions for 2014 as I need to get a few things out the way, like, lose a bit of weight- I have stuck some pounds on these last 6 months, and all my own doing, so I am going to get out more and enjoy life as much as I possibly can. I need to get out more and see many cool places that are in this great country, the Cafe Racer and Custom Motorcycle scene has grown so much in the 13 years I have been here and seems weird to think that back then I had to paint Cafe on the tank so people knew what it was as everybody used to stop me and ask what the motorcycle was i was riding. There are way too many negatives in the world and I am not one of them, I will be more positively charged than a new battery come January the first and looking forward to see what ahead in the next 12 months. I am looking forward to designing new parts and building the bikes that I love to create. Been a tough year for me as regards to work, as I had to move shop and set up again, and I am still trying to get the shop to how I would like it, but almost there and 2014 should help me complete my task of a cool workshop and i hope to be bringing more parts out to show you all, especially exhaust systems. 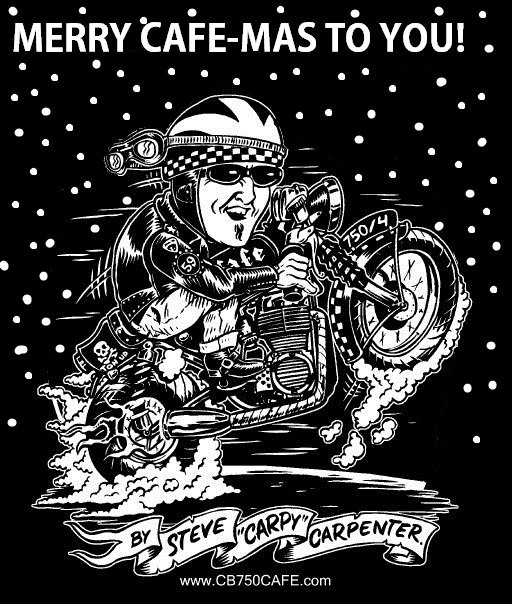 So, here in Anaheim, I wanted to thank you all for being my customer, reading my blogs and hopefully- enjoying what we do here at Carpys Cafe Racers and look forward to hearing from you soon, we always like to hear from you and maybe get to meet you at some of the shows I will attend in 2014.
keep building them machines and above all, have fun in what you do and maybe I will get to see you at a show in the coming months? Peace and Grease to you all. Have a fun festive time and hope the jolly fat man brings you all that you wish for. This entry was posted in Blog and tagged cafe racer, cb750, chrstmas, custom, Honda, hot rod, rocker, ton up. Just some cool viewing for you this weekend. It’s Christmas Day- MERRY CHRISTMAS ALL !! !